Wanted a half-helmet for a certain bike rally in August when my full helmet is at risk of growing legs and walking off by itself. This is an affordable option with cool graphics, and I won't be completely heartbroken if someone decides they need it more than me during the rally. Comfortable, affordable, and still manly enough for my husband. Win. I am from Florida and we don't require helmets and that looks like a light helmet. Since I ride in Alabama for the next year, I could live with that helmet. THIS HELMUT LOOKS LIKE A GOOD SIMPLE UNIT ,THAT WILL KEEP THE POLICE OFF MY BACK AND STILL BE ABLE TO HERE THE RIDE.. This was my first helmet and it has worked really well. Matches my Skull Neoprene Face Mask. Completes the look I'm going for. Does the helmet have dot stamped on the back of it? Yes it is dot approved. BEST ANSWER: Yes it’s padded but requires a narrow head for correct fitment. In my case it didn’t work out. I really liked the design and the open feel for around town rides. I would not recommend for longer trips. Does this helmet give you the mushroom head look? BEST ANSWER: This one is better than some. I actually bought a different helmet and returned it because of the mushroom head look. This was my second purchase and I kept this one. I think all half helmets with a DOT rating have this issue to some extent but this one isn't too bad. No, not at all. Looks like a normal half shell helmet and works well. Does the straps click into each other to fasten or is this a feed in buckle type? The straps are the standard feed in type you just need to be sure the metal loops are in the proper position to cinch tightly. Great helmet I wear it everyday. Buckles and snaps. Had quick release installed in mine. Much better. 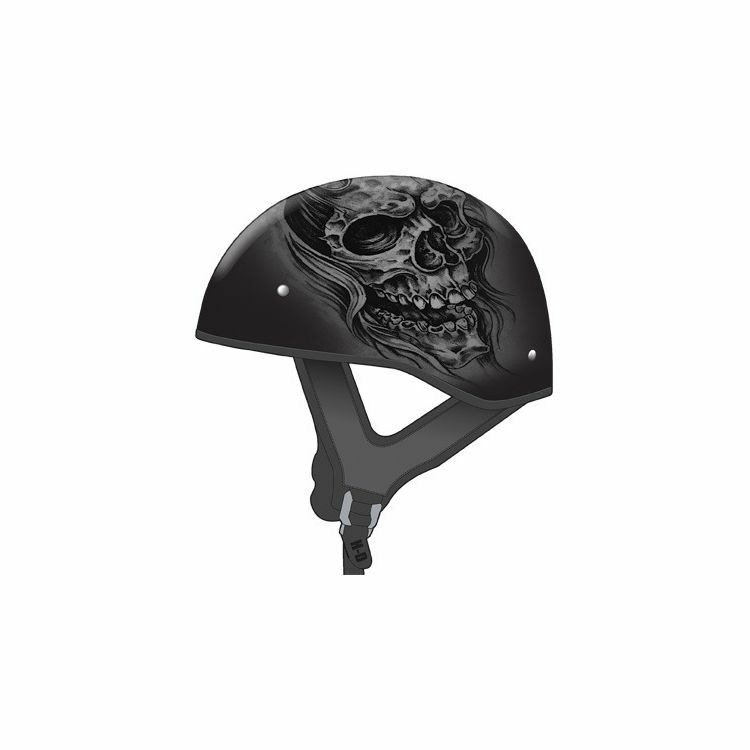 Is the GMax GM65 Naked Ghost / RIP Helmet flat black or gloss? Is this helmet DOT and SNELL approved? BEST ANSWER: Definitely DOT approved - I don't see anything approved by SNELL on the helmet. I really like this helmet I wish it had the flip-down visor? BEST ANSWER: Has both shade and clear flip down visor. Yes. It has a flip down sun visor. Are all your helmets DOT? BEST ANSWER: Yes this helmet is dot. On the half helmets do I measure around my head the same way as video or is that for the full face helmet?